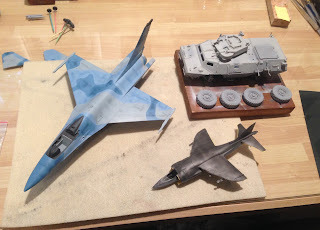 I usually have two models on my workbench at any given time, one is in the construction phase and the other is in the painting and weathering phase. This works for me, because I can work on one model while the other one sets up or dries. Unfortunately, at the moment I have three models on my workbench, each of them in the painting stage, and it’s bumming me out. I’ve been spending a good bit of time at the workbench recently, but progress is slow-going. I'll spend an afternoon on the F-16 and make good progress, but the Harrier and Guardian remain untouched. Or I'll spend two hours masking the Harrier and the F-16 hasn't moved to the next stage. Completing a model is a satisfying experience, but completion of any one of these models feels like a long way off. I think the only way I can actually complete one of them is to devote my time to just one, then another, and then the third. In the meantime, no matter how I proceed with finishing them, my interest in other models in my stash is growing. There’s the Academy A-37, for which I pulled a dozen books from the shelf to study loadouts. I’ve been itching to do another multi-engine bomber, so my Minicraft B-24 is calling my name. There have been a lot of conversations over the last few months about Soviet and Russian aircraft, which has been sparking an interest in that genre for me. When I have multiple models on the workbench, the key — for me — is to stay focused on those projects and not let myself get distracted. I just need to get back down to two models so I can find that focus. From posts to Facebook groups and discussions I’ve seen online it’s not uncommon for modelers to have literally a dozen or more models in various stages of construction and painting. If you’re one of those modelers, I’m curious to hear how you manage that queue and how it affects your enthusiasm for them. Right now I have eight on my bench. A 1/48 USMC F-4, a 1/35 tamiya jeep, and six 1/35 figures in various levels of completion. Since I'm retired, I have nothing but time on my hands. I work on one project a day, that way I don't get confused as to where I am on each project. I hadn't thought about retirement. I guess that would allow me to better allocate my time across projects. The best multiple build for me is 3; one in the basic construction stage, one in the painting stage and the other in the decal, weathering, flatcoat stage. Usually I work on one model for a week, then switch to the next for a week and then to the last one. This way each model gets my full attention for a week then a switch to a different skill set area. However it has happened that one model will outrun the others, and I may wind up with 2 models ready for paint at the same time so it is not a foolproof system. Naturally if I am working on a OOB build and a more detail adding, scratch building parts type of build this can easily happen. Also when a model is in the final finishing stages ( or in a complicated color scheme application stage) the week on/off rotation will usually stop so not to disrupt the continuity of the painting/finishing process. It's ironic, when I've had the opportunity to spend 8 full hours at the bench the most I actually spend is 4-5 hours. Like work, I guess modeling has its own fatigue factor. I always have at least 3-4 models (currently 6) on the go at any one time and manage them like a production line, by ensuring that each is at different stage of the process - build, paint, finish - before it progresses to the next one. I try not to have 2 or more models at exactly the same stage as it does have a tendency to hold things up, but it does happen from time to time and I just have to deal with it. There's no hard and fast rules of how to you deal with multiple builds, it's just something you get used to and work around. Just like you do in a day job. I think that's my challenge, too many models in the same stage. Lesson learned!